Welcome March | A.B.E. Remodeling, INC.
Folks, a new month upon our land. Just want to say have a pleasant, healthy and Lucky (shamrocks) kind of month. Here we are at the end of another month and March all set to come in. Will it come in like a lamb or a lion? 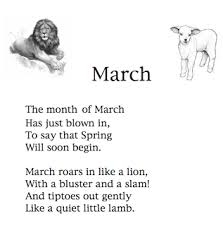 According to the latest forecast, March is set to come in like a lamb. Expect clouds with a high of 27. So where did the phrase 'In like a lamb, out like a lion' come from? So what will the weather be like for March? Check out the Almanac forecasts. NOW AS WE MARCH FORWARD... HAVE A MOTIVATIONAL DAY......and soon, we'll be springing ahead with the time change. Spring is peaking around the corner. Share the mood.